Kiszycki Kanreikai World Champion ! Representatives of OYAMA Polish Karate Federation acquitted themselves very well in the Kanreikai World Karate Championships in Danbury Connecticut, USA. The best of the Poles, Dawid Kiszycki, in the impressive style won the gold medal in the heavy weight category, defeating in the final fight Kamil Maras (USA, Kyokushin IFK). 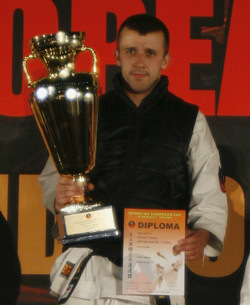 The silver medal was won by Tomasz Krysiak in the middle weight category, who went under fighter from the USA, Kenshikai. 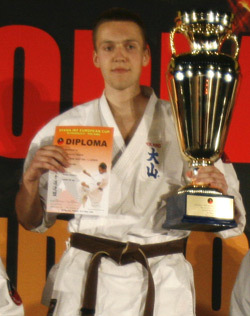 The third of the representatives, Łukasz Światowski the winner of the International YUKAN Ultimate Karate Championships tournament in Montreal, Canada in 2009, this time won the 4th place in the light category, going under Frederic Taylon (USA) in the fight for a bronze medal. Dawid Kiszycki 1st kyu is the representative of Białostocki Klub Oyama Karate, sensei Sensei Witold Choiński 4th dan is his coach. Tomasz Krysiak 1st dan is a karate student of Sensei Andrzej Tomiałowicz 3rd dan from Lubski Klub Karate OYAMA. Both medalists of the World Championship are succesful fighters. In the previous season, they won the first place in the Polish Cup OYAMA TOP in Lubliniec in December, 2008 and in the OYAMA IKF European Cup in Bydgoszcz in May, 2009. Duties of the team representative and sports' caretaker were fulfilled by Sensei Robert Bretner 3rd dan, Krakow. The representatives were also accompanied by invaluable Sensei Robert Małocha 3rd dan from the USA, who once again was very helpful for the Polish team. Thank you very much, OSU ! 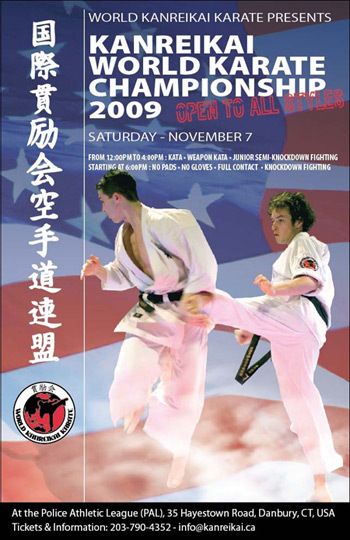 The Championships were organized by Hanshi Manny Matias 8th dan, the leader of the World Kanreikai Karate and Sensei Denis Cordeiro 4th dan, a director of the organization. In a spare time our representatives visited Manhattan and the surroundings of New York. Sincere congratulations on the great results in the USA, OSU !